Saudi Arabia has much at stake when its national soccer team enters the pitch for the opening match of the 2018 World Cup in Moscow. With politics a permanent fixture, Saudi Arabia is playing in the World Cup finals for the first time in more than a decade at a moment that the kingdom is vying for enhanced influence in global and regional governance of the sport. With Morocco’s bid for the 2026 World Cup in mind, Mr. Al-Sheikh had earlier warned that “to be in the grey area is no longer acceptable to us. There are those who were mistaken in their direction … If you want support, it’ll be in Riyadh. What you’re doing is a waste of time…,” Mr. Al-Sheikh said. An analysis of the Arab vote in world soccer body FIFA’s ballot in which Morocco lost out against a joint bid by the United States, Canada and Mexico, produced a mirror image of the deep divisions in the Arab world over regional disputes, including the one-year-old Saudi-United Arab Emirates-led economic and diplomatic boycott of Qatar and the kingdom’s rivalry with Iran. Angry at what they asserted was a successful Saudi campaign to persuade Arab and Islamic countries to break with the principle of Arab, African and Muslim solidarity and to vote for North America rather than Morocco, Moroccan officials suggested that the vote was likely to deepen divisions and further strain once close ties between the two kingdoms. Mr. Al-Sheikh’s remarks followed a veiled threat by President Donald J. Trump, in violation of guidelines regarding political influence of world soccer body FIFA, against nations that may oppose the US-led proposition. The FIFA vote on the eve of the World Cup was the latest element in the Saudi attempt to exert influence in soccer governance with the kingdom’s spat with Morocco only one of several public controversies involving Saudi Arabia and Mr. Al-Sheikh. 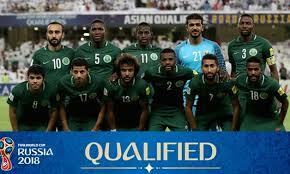 Casting a shadow over Saudi Arabia’s success in qualifying for the World Cup was the fact that hours before the opening match, Saudi fans remained deprived of legal access to broadcasts of matches. Saudi Arabia has yet to reach an agreement with beIN, the sports subsidiary of the Qatar-owned Al Jazeera television network that owns the broadcasting rights. The states boycotting Qatar are demanding that the Gulf state shutter Al Jazeera or at least curb its freewheeling reporting and talk shows that often challenge the policies of countries like Saudi Arabia and the UAE. As a matter of principle, BeIN has been blocked in the boycotting states for the past year. While Saudi Arabia has sought to ignore Qatar’s rights by creating beOutQ, a 10-channel bootlegging operation based in the kingdom, the UAE backed down at the 11th hour from its blockage of beIN broadcasts but maintained its jamming of Al Jazeera. beOutQ transmits over Arabsat, a Riyadh-based satellite provider Arabsat owned by Saudi Arabia. Egypt, a member of the anti-Qatar, alliance has asserted that the awarding of the broadcasting rights to beIN violated its competition law and said it would oblige FIFA to allow its state broadcaster to broadcast 22 matches free to air, including those of the Egyptian national team. The Confederation of African Football (CAF) warned Saudi Arabia and Egypt by implication on the eve of the World Cup not to pirate World Cup broadcasts. “Recently, an entity called beOutQ has put in place a major piracy operation against beIN Media Group. In this regard, CAF strongly condemns the practice of the audio-visual piracy of sport events, a real scourge for our industry. CAF is determined to take all necessary against beoutQ if any of CAF matches are pirated,” the soccer body said. The Saudi national squad’s geopolitical baggage in Russia contains more goodies. Against the backdrop of a Saudi-UAE campaign to get FIFA to deprive Qatar of its 2022 hosting rights, Saudi Arabia has been manoeuvring to ensure that it has greater say in the issue while at the same time isolating Iran in the global soccer family. In a further bid to complicate life for Qatar, Saudi Arabia backed a proposal to speed up the expansion of the World Cup to 48 teams from 32, which is now scheduled for 2026, by making it already applicable to the 2022 World Cup. FIFA has delayed a decision on the issue. If adopted, Qatar could be forced to share the hosting of the 2022 tournament with others in the region. Iran has already offered to help Qatar. The Saudi-UAE moves come on the back of a two-pronged Saudi effort to gain a measure of control of global soccer governance. Global tech investor Softbank, which counts Saudi Arabia and the UAE among its largest investors, is believed to be behind a $25 billion proposal embraced by FIFA president Gianni Infantino to revamp the FIFA Club World Cup and launch of a Global Nations League tournament. If approved, the proposal would give Saudi Arabia a significant voice in global soccer governance. Complimenting the Saudi FIFA bid is a Saudi effort to undermine the position of the 47-nation Asian Football Confederation AFC headed by Salman Bin Ibrahim Al-Khalifa, a member of the Bahrain ruling family and one of the most powerful men in global soccer. To do so, Saudi Arabia has unilaterally launched a new regional bloc, the South West Asian Football Federation (SWAFF), a potential violation of FIFA and AFC rules. The federation would be made up of members of both the AFC and the Amman-based West Asian Football Federation (WAFF) that groups all Middle Eastern nations except for Israel and is headed by Jordanian Prince Ali Bin Al-Hussein, a prominent advocate of soccer governance reform. All of this could come to a head on the pitch if both Saudi Arabia and Iran were to make it out of the group stage and clash in the semi-finals. “Saudi Arabia’s clash with Iran would be an explosive affair,” said a headline in the Asia Times.